Vivid colors and interesting shapes. 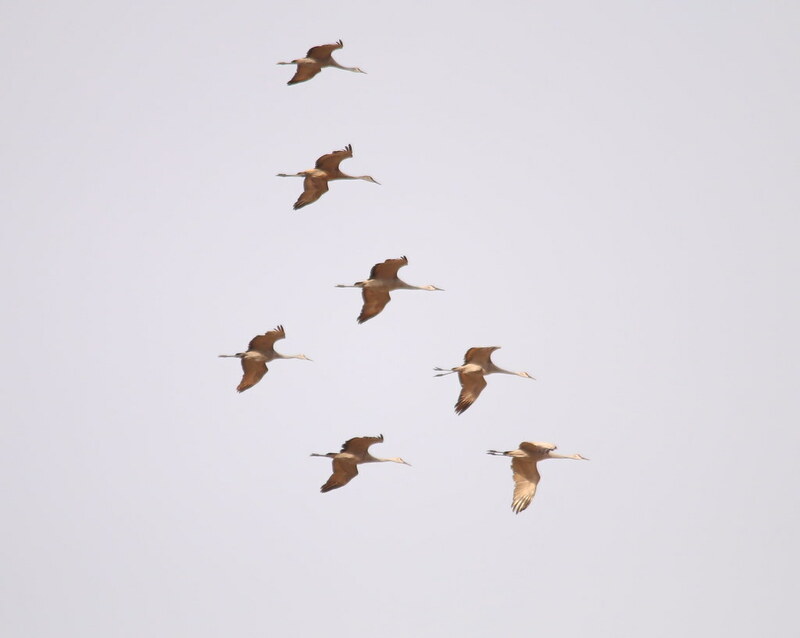 It was such a nice day on Sunday, temps around 50 F. There have been reports that some Sandhill Cranes in the area. 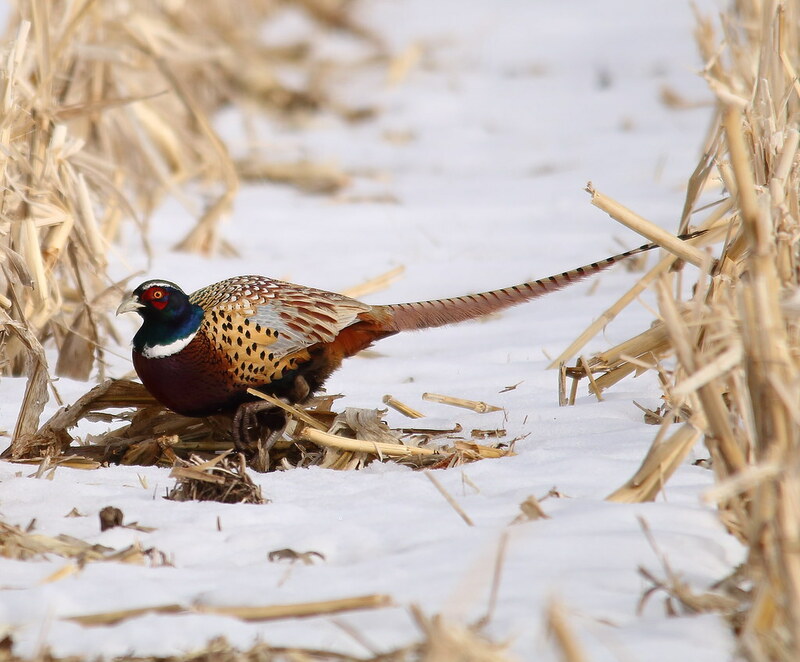 We know that the spring migration is about to kick off but usually it is closer to Valentine's Day. 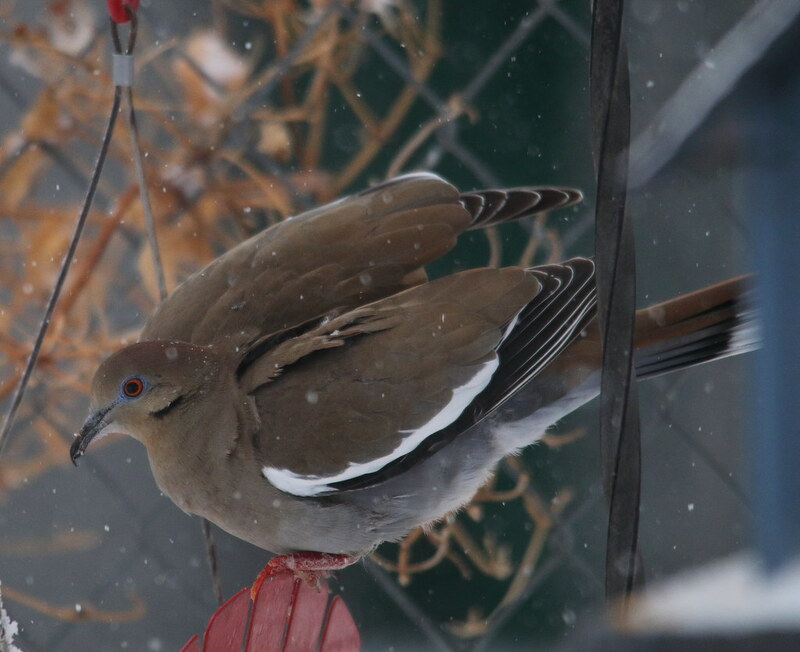 I decided to go see if I could find some and also to just look for a few other birds. 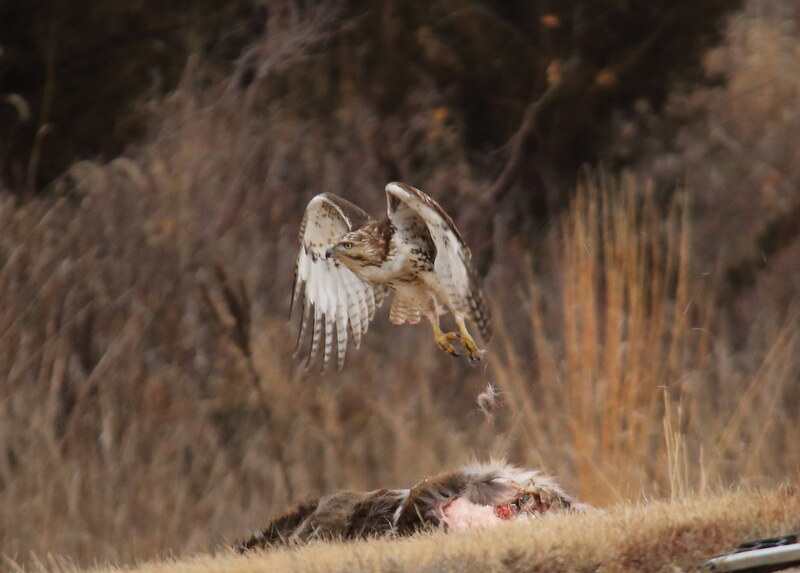 Driving around I found lots of hawks but still not able to find those cranes in the fields. I decided to go check out the blind that I do most of my Crane Tours and sure enough there were Cranes in the field right across the river. 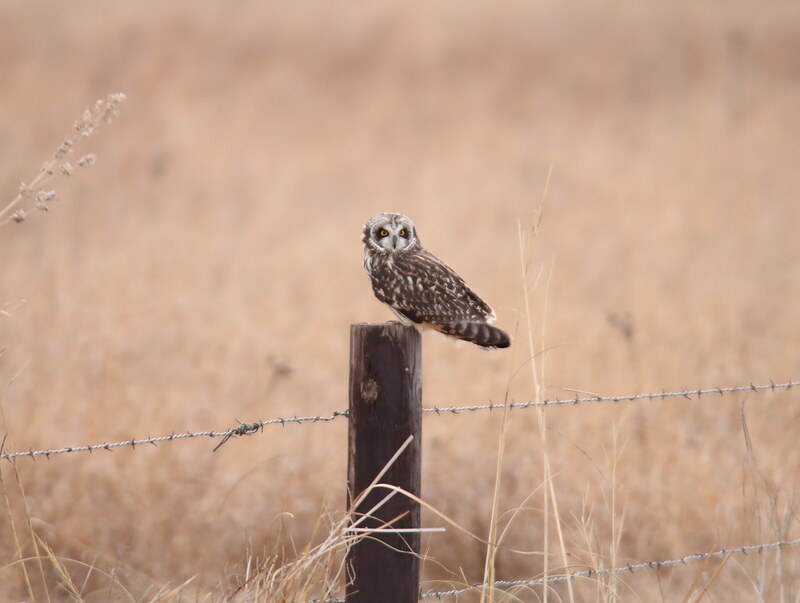 More and more kept flying in as i was there BUT I had another reason to go birding, I wanted to find some Short Eared Owls. 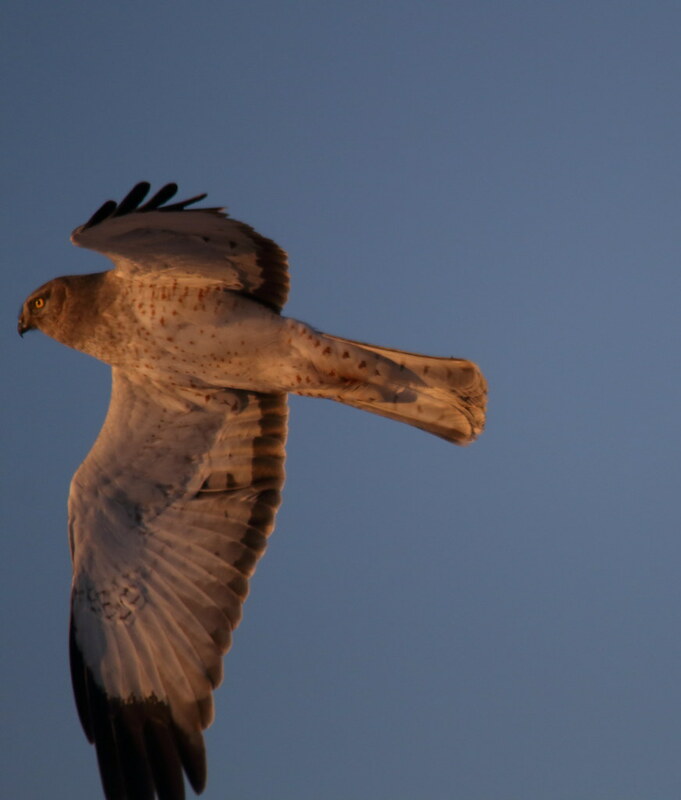 They come out just about sunset and start hunting over the fields. 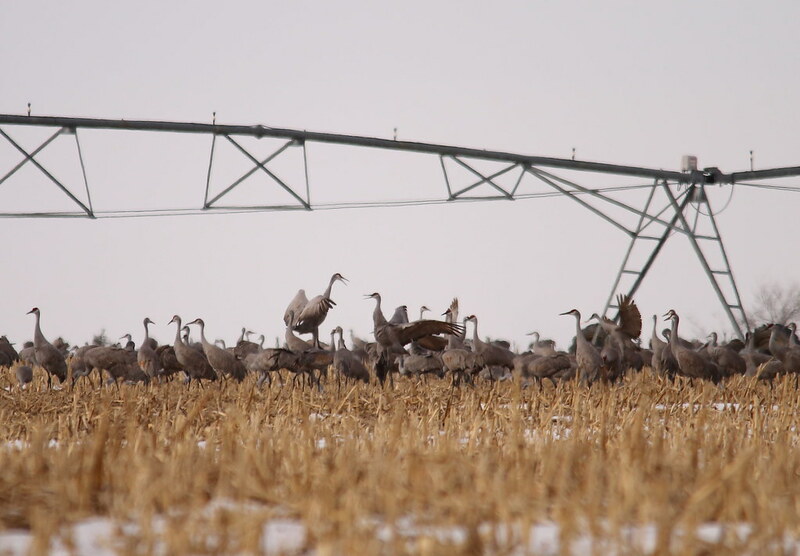 They have been seen just a couple of miles to the west of the crane blind. I got there and set up to look for them. 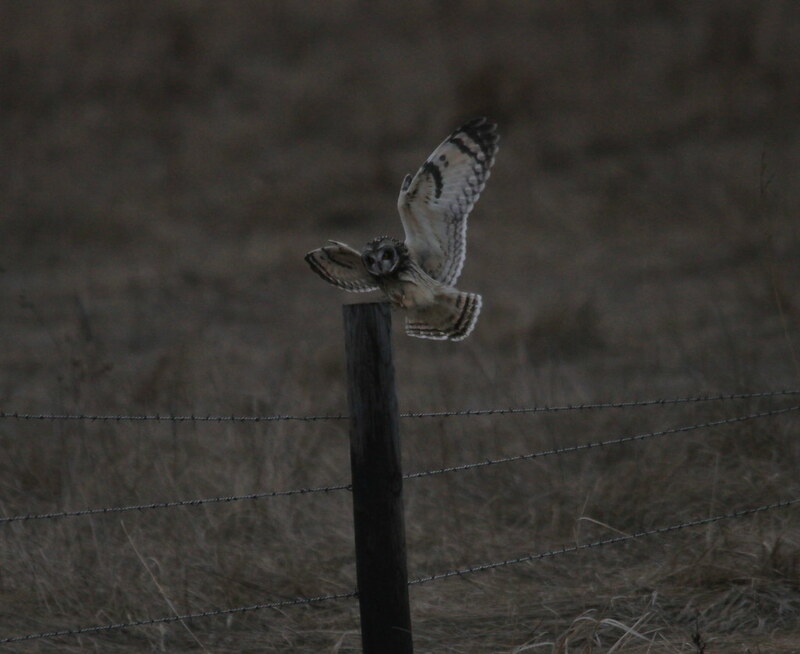 Well I was not disappointed - out they came and the were flying and scanning the fields looking for mice/voles. 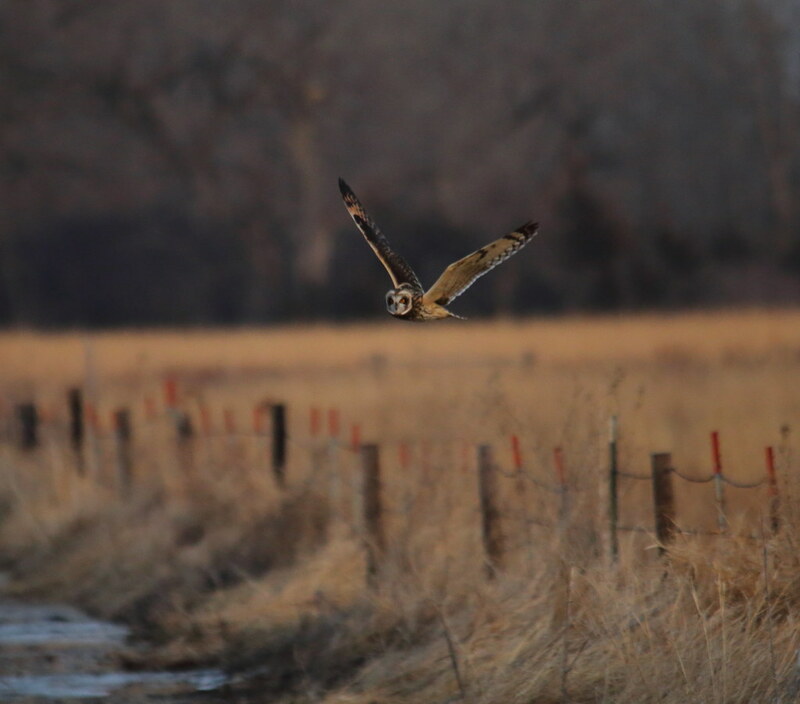 So I got a few photos (flying owls shots are difficult) and then back to the river to watch the Sandhill Cranes. 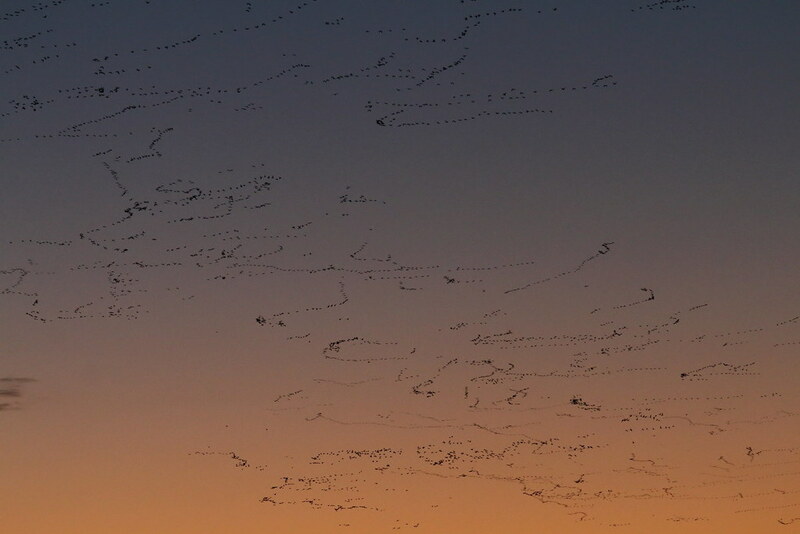 At this point is was after sunset but of course still some light, the cranes were flying in in large numbers but of course not to the river yet. I thought maybe since the river still had lots of ice in it that they were going to stay on the bank. 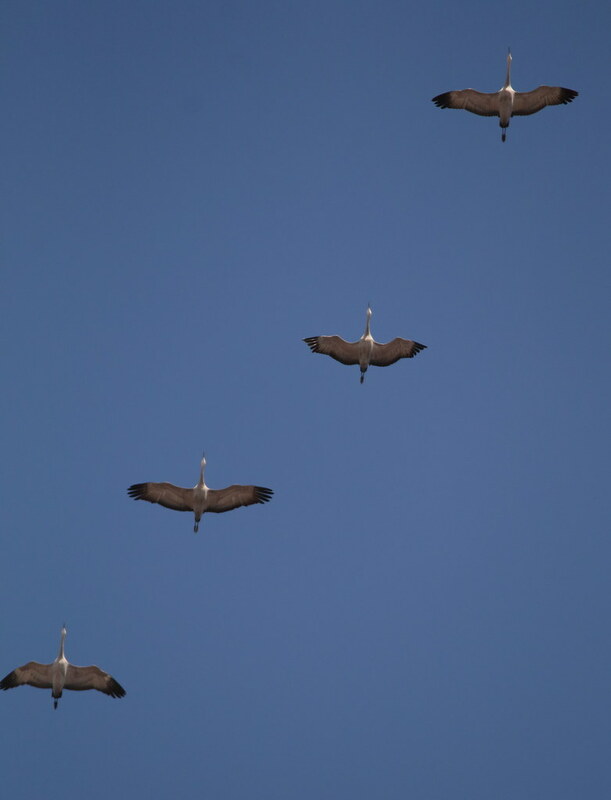 I packed up to leave and was half way to the car and I heard this sound...........the sound of cranes lifting off. I turned and thought do I head back or just go home............ Of course I turned and ran back to the river. Yes they were landing in the river on the ice. Their sound just resonates in the air when they call. They are back !!!!!! Open fields, wetlands, prairies make for wonderful habitats. 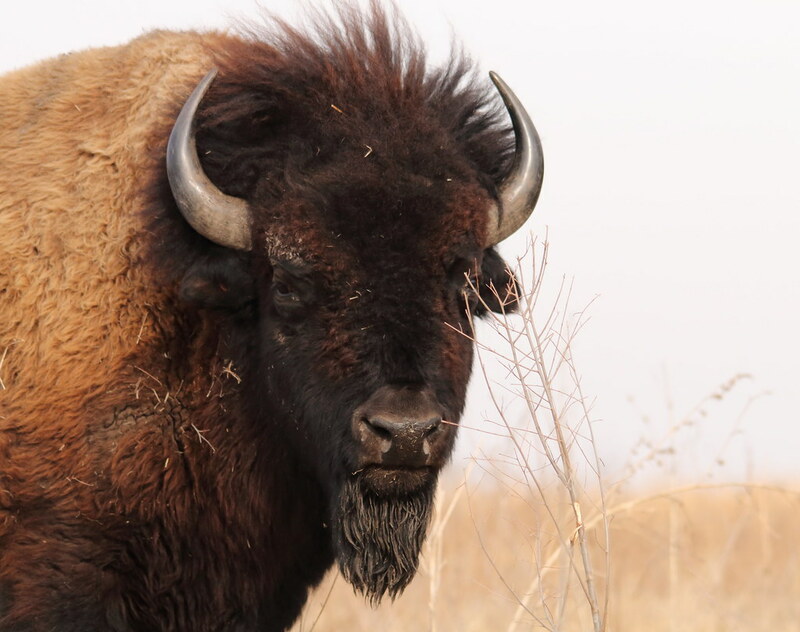 You know you have something special when you see wildlife thriving in those areas. It doesn't come easy now days. Many farmers till the land and plant crops which break up the sections of land and cause fragmented prairies. There are agencies that work to restore and protect these areas and when that happens people can sure enjoy seeing the results. 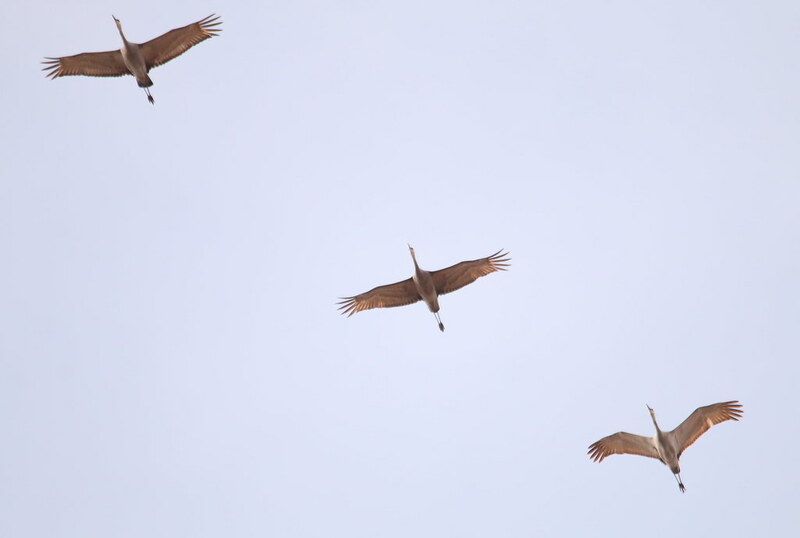 The Sandhill Cranes and the Whooping Cranes benefit from all the work on the river. Restoring crop fields back to native lands is another area that takes lots of man hours. 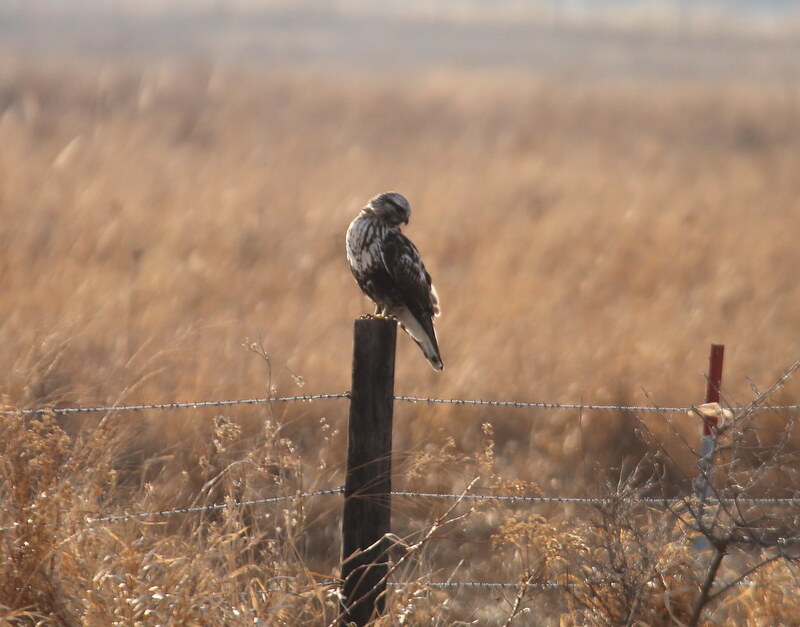 There is a great wetland area just off of the river that a few short eared owls have been hunting on along with the Northern Harriers. Last night I just parked on the road and waited for them to come out. 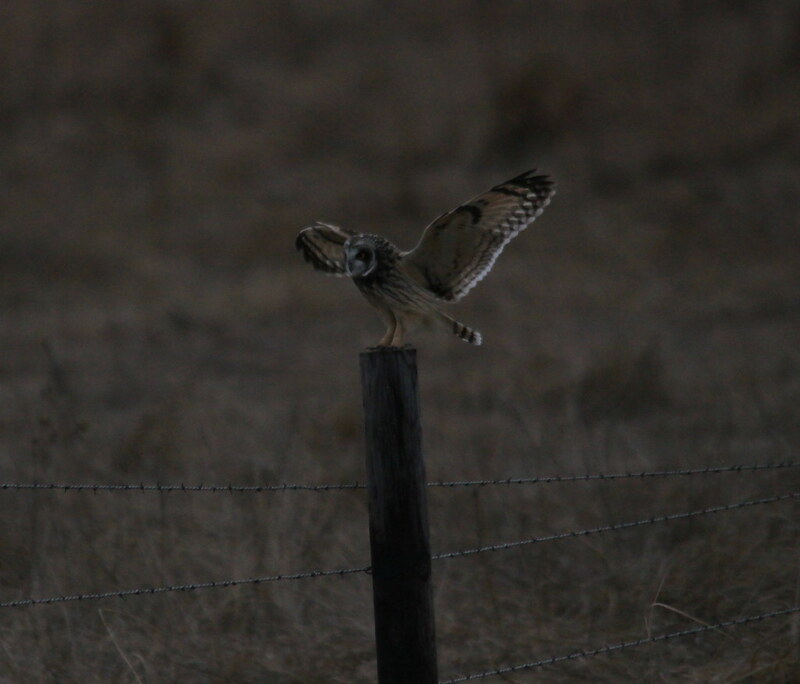 It wasn't long and there an owl appeared on the fence post. Ever alert looking around for his first meal I am sure. Of course the day was cloudy so the light was not going to be the best. 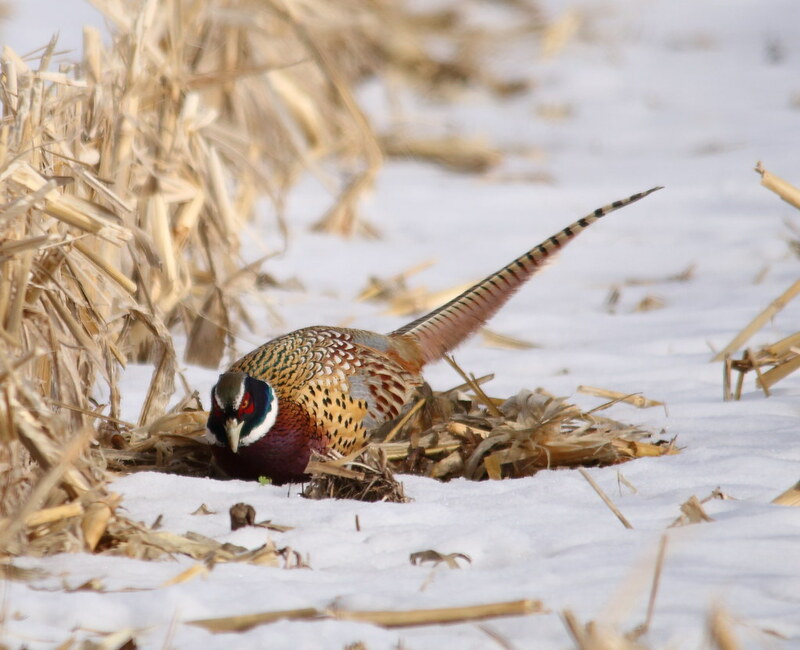 Looking around there was one flying on each side of the gravel road looking in the ditch for his meal. I had to get out of the vehicle so I could follow the flight. At one point one flew right along the side of me (well those pictures didn't turn out well at all). 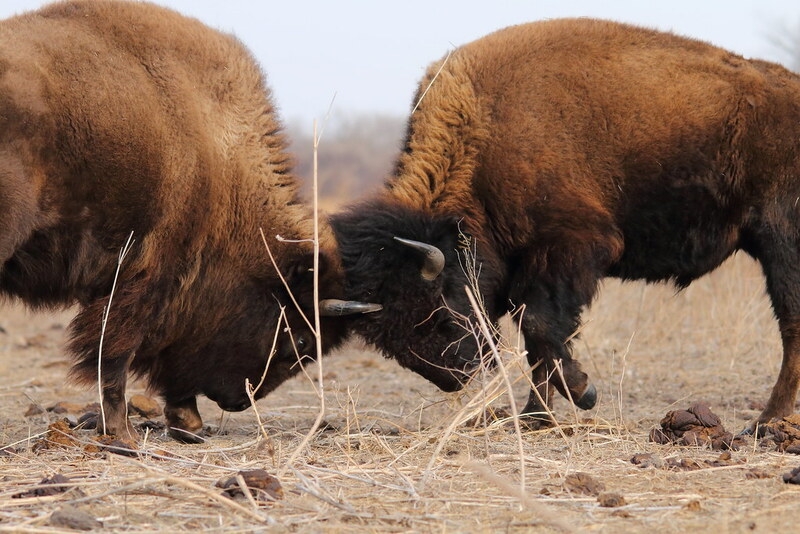 Bison use to roam the prairies in massive numbers, then they were almost wiped out. 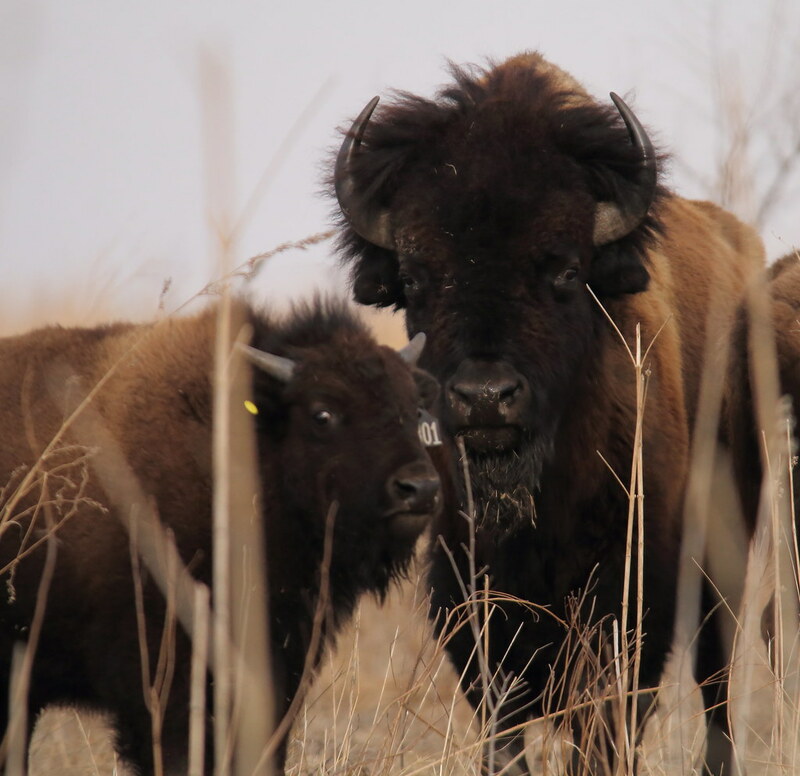 Bison play an important role in prairies so that is why the Crane Trust has reintroduced bison to their prairie. They graze the grasses differently, they make wallows, they are a very hearty animal in the elements. I sat and watched a small number of them. At first they were unsure and moved away, then one decided to take a few steps towards me. The bull ( which had a really messy hairdo) kept a young calf by him and gradually took some steps forward. They must have figured I was OK because they moved closer and continued to graze, two decided to play a little head butting game. 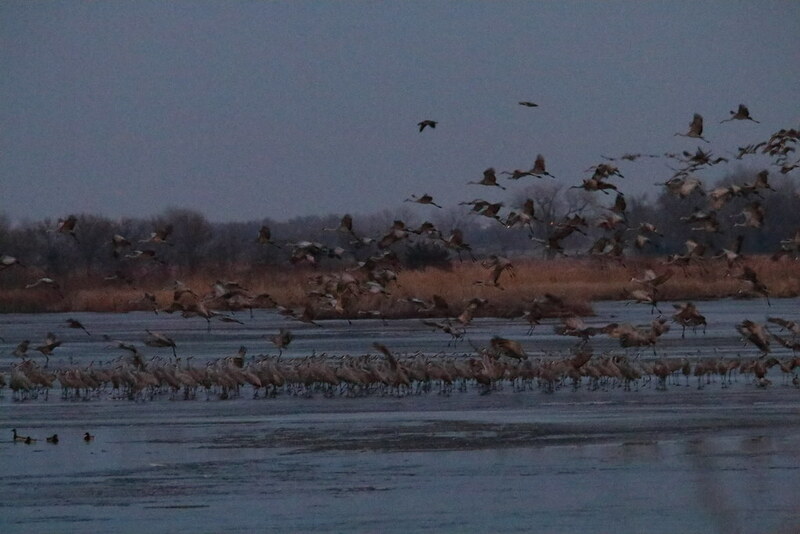 It was cold and windy, after sitting there for a long time I had to go warm up, but I sure enjoyed watching them. 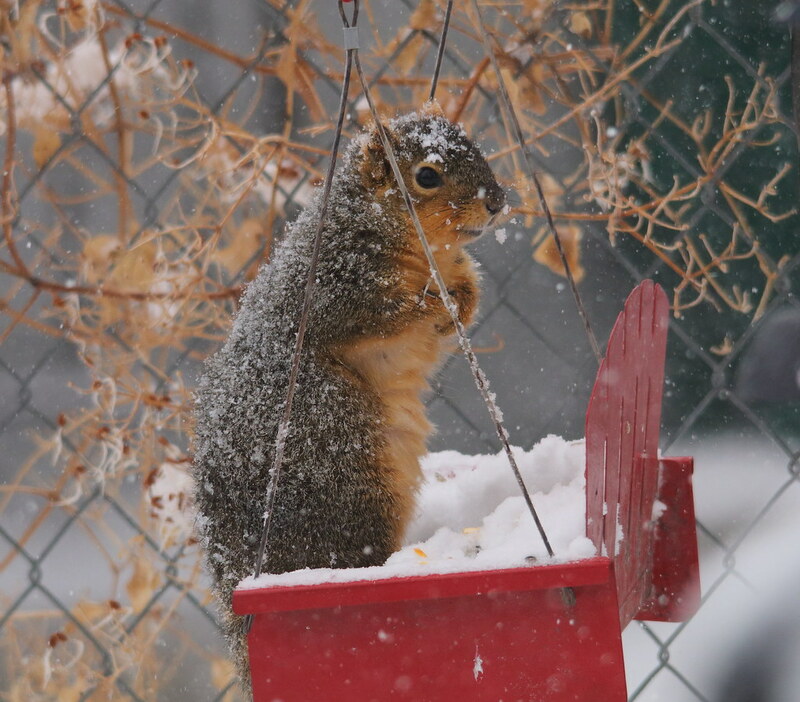 How wonderful to see such a variety of wildlife where you can sit and observe them. Your photos are always interesting Deb but I have to say the bull would have been far too close for my comfort! 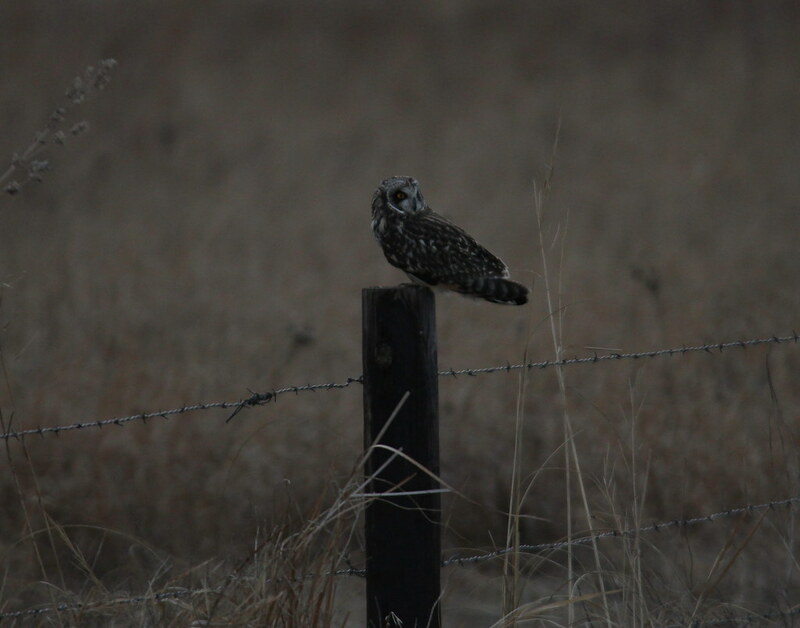 I was enjoying an evening at the wetland field, hoping to see some short eared owls. 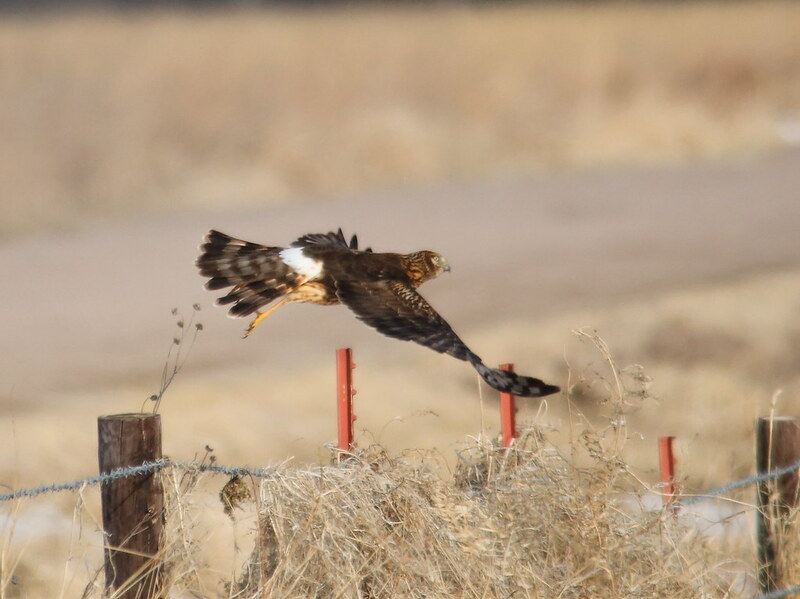 While waiting for sunset there was a Northern Harrier that was hunting and it flew right by me, almost to close for my camera lens. Amazing to see the focus in his eyes as he went by. More snow today but this one comes with strong winds. 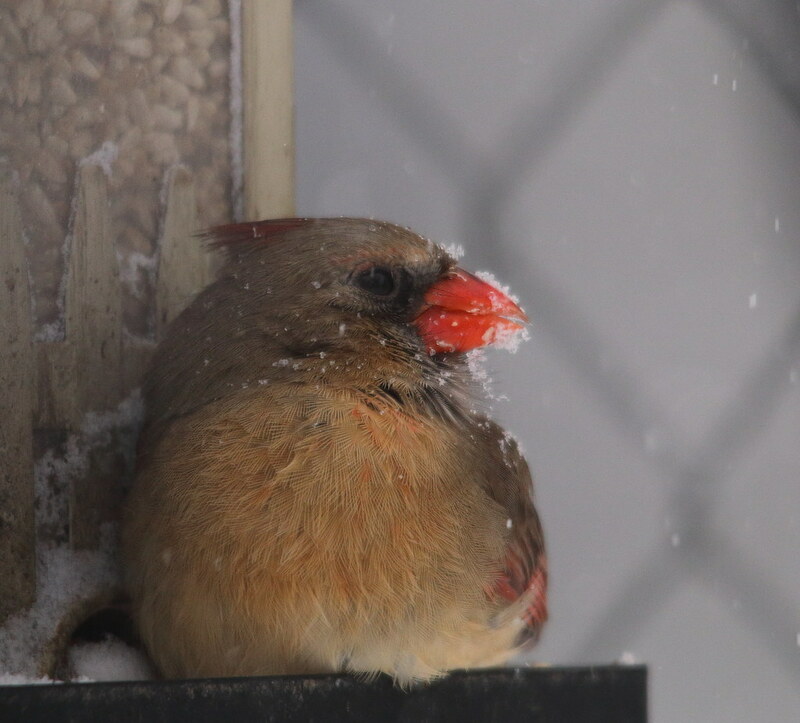 I went out and had to clear off the snow from the feeders and shortly there were visitors (four legged and two legged ones). 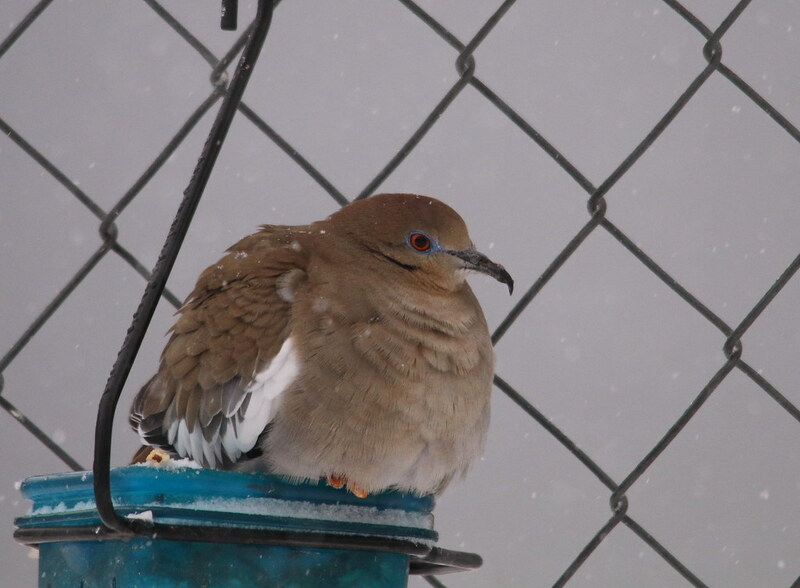 The White Winged Dove is a special visitor. Took a couple of videos during the snow today. 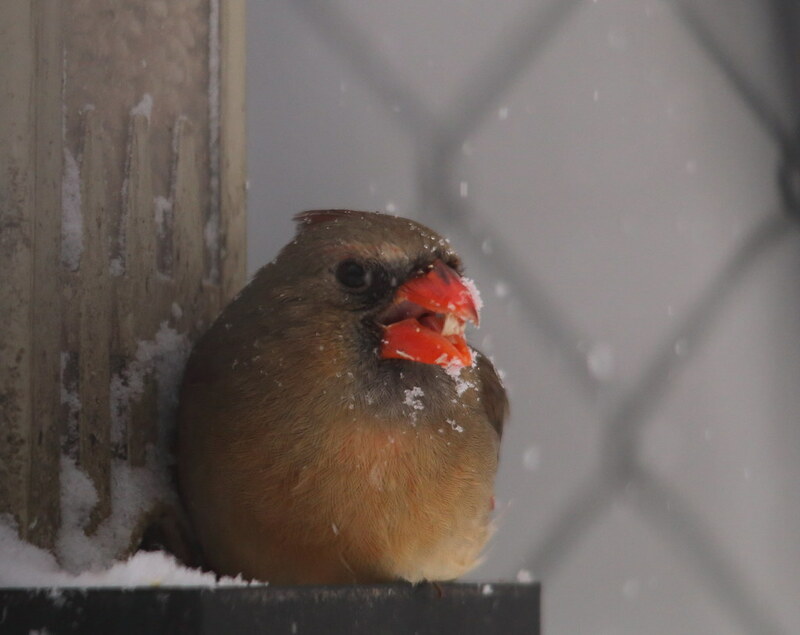 Winter has been hanging on making it very miserable to do some birding. 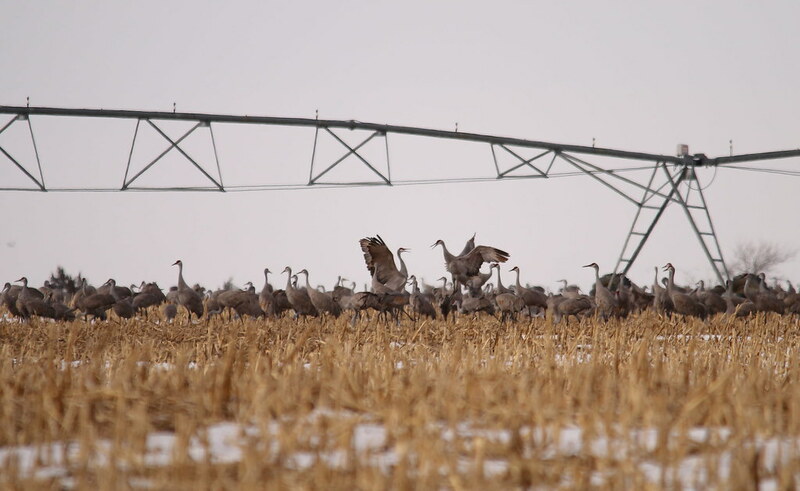 The Sandhill Cranes have been staying away due to the cold and snow. There has been a few thousand here but the rest have been waiting for better weather. Today was one of the nicest we have had in such a long time. 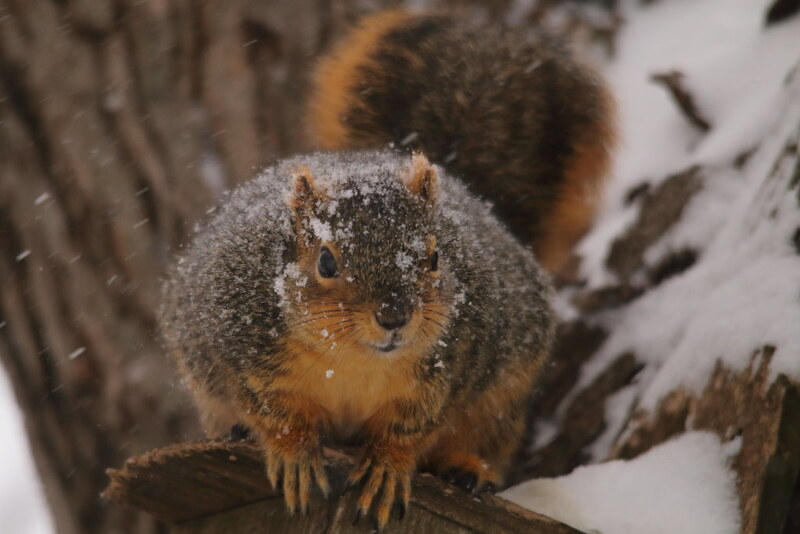 There is still plenty of snow but I think everyone is ready for Spring. 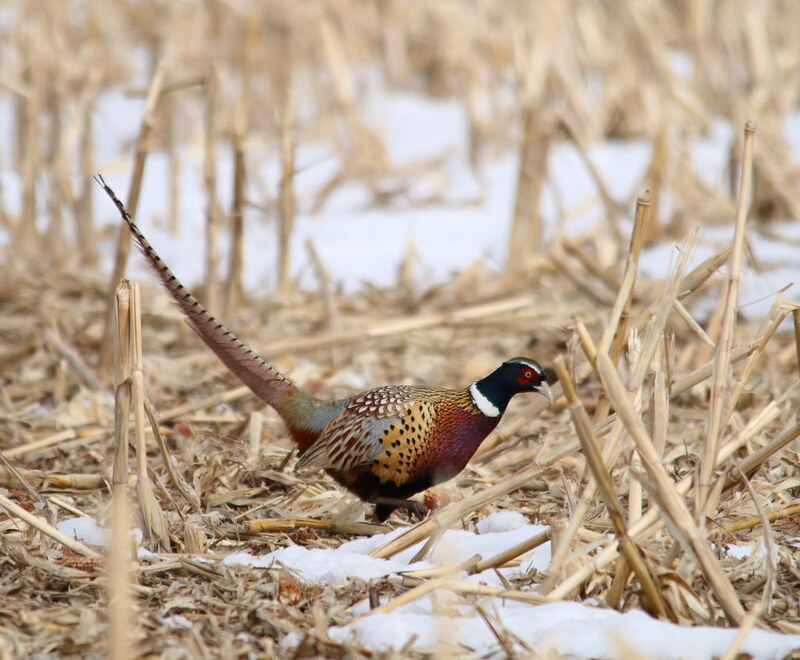 Not only the Sandhill Cranes were out but a very handsome Ring Necked Pheasant along with a Northern Harrier hunting. 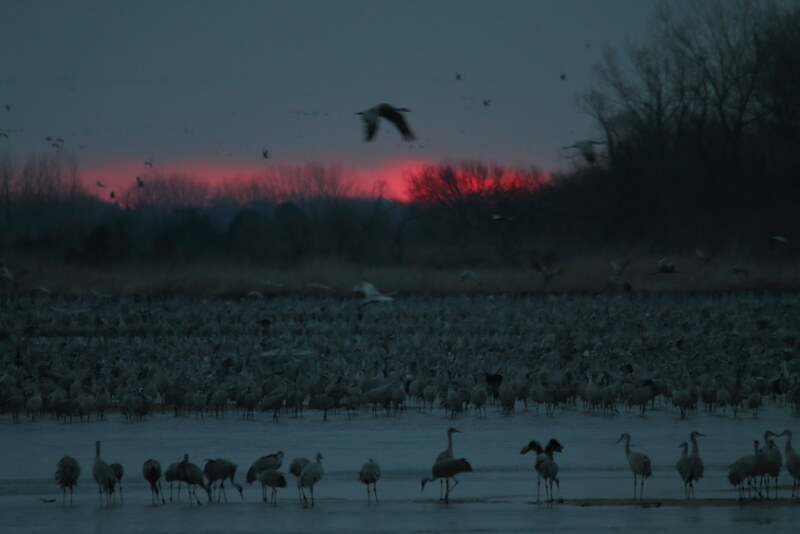 March is Migration and Sandhill Crane season so I got out a few times. 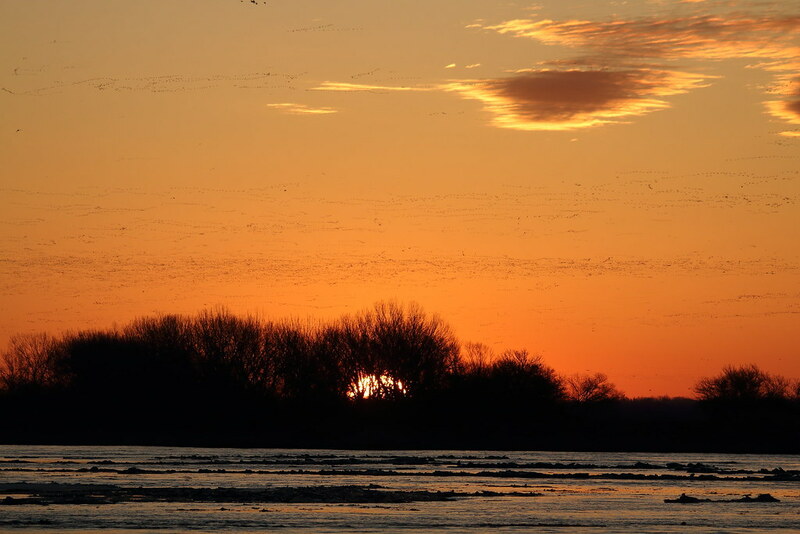 First is early morning as the sun was rising and the sky was filled with snow geese flying. As it lightens you get a view of the massive number of cranes standing in the river.